Running nightly from 6:00 p.m. - 10:00 p.m. Cost: $8 per car; $22 per large passenger van or any vehicle towing a trailer ($22 per trailer); $30 per bus. We accept cash and credit. Gift certificates ($8) and discount punch passes ($35 for 5 admissions) are available at the Spanish Fork City Office (40 South Main) or at the Parks & Recreation Office (775 North Main). **Listen to the holiday music on 99.7 FM while you drive through the displays. For more information, visit www.spanishfork.org/fol. The Oaks at Spanish Fork will not be available for Festival of Lights parking or for trailers loading passengers. 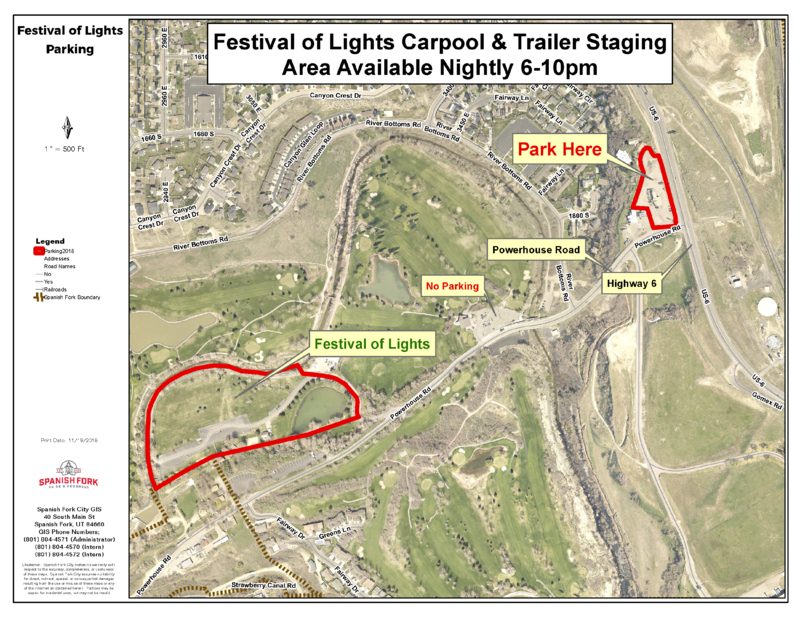 To accomodate Festival of Lights patrons, the City has received permission from the Little Acorn and Prestwich Farms for Festival of Lights patrons to use their parking lots to stage trailers and to park vehicles for carpooling. Festival of Lights patrons may use these parking lots (corner of US 6 and Powerhouse Road) nightly between 6 and 10 pm.